Andrew was born in Ludgershall, Wiltshire in November 1890 - the day appears as both the 5th and the 31st in his military records. He was the fourth child and third son of John Joseph Fox and his wife Martha Louisa (née Sadler). John was a Glaswegian tailor who married Martha in Wiltshire (she was from Broad Hinton), shortly after the birth of their first child, Edward Henry in Marlborough in 1893, and settled in Ludgershall. Seven children were born to the couple in Ludgershall: Harriet Victoria (born 1887), Charles Russell (1889), Andrew John (1890), Annie Elizabeth (1893), Alfred Ernest (1896), Joanna May (1900) and Joseph Patrick (1902). In 1902, shortly after the birth of Joseph (Joe) the family moved to Newbury, settling at 2 Arthur Road. A ninth child, Francis, arrived in 1910; he was 3 months old when he was recorded in the family’s 1911 census return. This census form also reveals that John and Martha had lost one unnamed child in infancy; this was probably Frances Fox who was born and died in Ludgershall in 1886. Young Andrew completed his schooling and found employment with a local grocer, Mrs Brice Gould, in Bartholomew Street. He then moved on to work for Walker’s Stores in the Market Place. His elder brothers, Edward and Charles had both left home for a life in the Army, Edward with the Hampshire Regiment and Charles with the Royal Berkshire Regiment. Andrew did not elect to serve as a regular, but he did sign up with the local Territorials - the Newbury Company of the 4th (Territorial) Battalion, Royal Berkshire Regiment. However, he resigned from the Newbury Company when he set off for France. Having learnt the language while working at the Ritz Hotel in Nice, he was able to find employment in French stores as an English speaking assistant; it seems a very adventurous move for the son of a small town tailor. He worked in Dinant, Nice and Paris. When war broke out in July 1914 Andrew was in Paris and it was reported that he was ‘called upon to render military service there’. Whatever this service might have been (probably as an interpreter) he was soon back in England, where he enlisted on 5 October 1914 at Newbury as a Driver in the Army Service Corps (ASC). His previous experience with the Newbury Company and his proficiency in French must have stood him in good stead for he was soon promoted, on 10 October to Lance-Corporal, on 17 October to Corporal, on 20 October to Sergeant and, on 16 November, to Company Sergeant Major! On 12 July 1915 he crossed to France with No 2 17th Divisional Train, ASC land at Le Havre on 13 July. This Company was part of the 17th (Northern Division) providing logistical support to the division. In 1915 a number of newspapers, including the Newbury Weekly News, printed a patriotic poem entitled The Forgotten Brigade the authorship of which was unknown. Not only was the writer unknown, even the brigade that had been forgotten was unclear, despite it being clearly stated in the poem. The problem was that it was all too easy to substitute a couple of lines and it was about another brigade, so, for instance, the Gloucestershire Echo published a version praising the 78th Brigade (the Worcesters, Gloucesters, Oxfords & Bucks). The poem (see Appendix below) tells the tale of a brigade left forgotten in a camp in England reflecting an impatience among the Kitchener Army frustrated that, despite months of training, they still hadn’t been called to join the fight in France. A letter from Sergt-Major Andrew Fox, of the Army Service Corps, 50th Brigade, Expeditionary Force, France, informs us that the author of the poem, “The Forgotten Brigade,” is Lce Corpl G Mulligan, of the 6th Dorset Regt, who composed it about the month of January last, when the 50th Brigade was stationed at Wareham, Dorset. The poem, he further says, was printed on post-card form, and thousands of copies were sold. We are glad to make this explanation in justice to Lce Corpl Milligan, and may state that ours was a type-written copy with the information as stated in a previous number. Curiously it appeared in none of the papers in this part of the country until after it was printed in the “NWN”. Sergt-Major Fox says he receives the “NWN” regularly, and hands it round to a few local men in the Brigade. Did Lance-Corporal Milligan (11398 Walter Milligan, 6th Battalion, Dorsetshire Regiment) really write it, or did he merely modify it to refer to the 50th Brigade? Andrew was with the 17th Division in France for less than a year, during which period they took no part in any major action. However, Andrew must have continued to impress because, on 9 September 1915 he was appointed Acting Staff Sergeant Major (WOII) and then, on 22 April 1916, he was discharged from the ASC in order to take up a commission as a Second Lieutenant in the 6th Battalion, Royal Berkshire Regiment. This date is also given in his record as the final day of his time in the ASC overseas with the BEF. As he had not left France prior to receiving his commission he must have received his officer cadet training at the GHQ Training School at Blendecques near St Omer in France. After receiving his commission he had a short home leave before joining the 6th Battalion in the field at Maricourt, France on 29 April. Mr John Fox, a well-known Newbury tailor, is proud of the fact that all his four sons are on service, and has reason to be also proud of their patriotic record. One of them, Edward, has been a prisoner in Germany for eighteen months. Another, Corporal C R Fox, of the Royal Berks, has been discharged from the Army. He has done ten years, and went through most of the serious fighting in France. A third son, A J, has had a rapid run of promotion. He had been in civil occupation in Frqnce, and had a good knowledge of the language. At the outbreak of war he enlisted as an interpreter, and was appointed requisition and supply officer in the ASC. His promotions came rapidly. Lance-Corporal, October; Corporal, November 1914; Sergeant December 1914; Colour-Sergeant, January; Staff-Sergeant-Major, July 1915. He has just recently been granted a commission as second-lieutenant, and posted to the 6th Battalion of the Royal Berks. He has been home on Easter leave. France, Maricourt Defences. Fine & warm. Companies worked in morning. Bn relieved in defences by 19th (S) Battn Kings LIVERPOOL Regt. Relief commenced at 9pm & complete about 11-30pm. Bn marched out to BOIS CELESTIN camp beyond BRAY & last party arrived at 4am. Lt KR Traill & 2/Lt Sadler returned from Bde Grenade School. 2/Lt AJ Fox joined Battn from Cadet School. 2/Lt AH Hudson & 8 OR proceeded on leave. Second-Lieutenant A J Fox of the 6th Berks, BEF writes:- "My platoon is at present resting away from the noise of the guns. I would very much like them to have as sports as possible while they are in rest; I have been able to fit them up fairly well with the exception of a pair of boxing gloves, Could you put me on the track of anyone with cheap second-hand set for sale? If so I would be greatly indebted. The local tradesmen are demanding fabulous sums for sports and games, and as they will become useless when we go back to the trenches, I would much rather a second-hand set. I have several Newburians in my platoon, and they are quite happy and fit, and enjoying their rest immensely during the fine weather." Not long after he arrived at the front the battalion took part in the assault on the German positions that has gone down in history as the blackest day of the British Army – the infamous first day of the Battle of the Somme. Much is made of what went wrong, so much so that few seem to know that there were parts that went right. Notable amongst these is the attack on Montauban at the southern end of the assault. Saturday June 24th was the opening day of the bombardment, which lasted continuously for seven days. For three days of the bombardment we were behind the lines, and out of reach of the Boche guns, but for four days we had to stick not only the sound of our guns but also the enemy's retaliation. Such a bombardment as our artillery gave them has probably not been equalled even in this war. All the accumulated mass of big guns and shells, of Trench Mortars and shrapnel, which has been turned out of our factories during the last year, was turned on the enemy. For seven days without rest we rained shell and shrapnel on the enemy's trenches, which were completely smashed up along the whole front. The enemy's retaliation was feeble, but he shifted his guns back and gave us rather a hot time in the front line - shells falling actually in our trenches and causing a great many casualties. Shells are vey bad for the heart, and, as you can imagine, my nerves are in a continual state of tension during all the preliminary bombardment. A great many men in my trench were buried by the shells but we managed to dig them out again. Sleep of course, was out of the question, and I have had no continuous sleep for over a week. I have simply snatched an hour or so at intervals in the bombardment. While the bombardment was in progress we made raids all along the front and found the enemy was completely demoralised, being only too glad to give themselves up. They even came to our lines and gave themselves up, but a great many were shot. On the last day of the bombardment our raiding parties discovered that the enemy had retired to his third line in many parts and was withdrawing his guns as quickly as possible. The enemy has nothing to equal our trench mortar guns. We saw Germans, literally, blown up into the air by them. The last two hours of the bombardment were terrific: the infantry were massed in the trenches awaiting the moment for the advance. After the nerve racking days we had just had, we were very glad to get over the top and I think most of us would have gone mad when we did get over. Our battalion acquitted itself splendidly, and took the enemy's trenches in great style. When we got to the enemy's second line I had a curious accident which probably saved my life. My platoon was to have stopped at the enemy's second line and consolidated, but in the excitement we scarcely noticed where we had got to and, when the wave in front of me got into the third trench, we found ourselves just behind them and 200 yards beyond where we should have stopped. It was death to go back so I had to take refuge in a shell crater where we had to stop for two hours. There were about six of us bunched together in it. Several times we tried to get out and crawl along but an enemy machine gun was trained on us at once and two men who crawled out by my side were hit. We decided it was death to go on as the enemy had evidently spotted us getting into the shell crater, so the only thing to do was to wait till the machine gun was put out of action which took nearly two hours. When it stopped firing for some time we crawled out and made our way into a communication trench from which we hurried up to find our company, but discovered it had lost heavily by enfiladed fire from the same gun as had been firing at us. Only a very few in my platoon were left and in the whole company not many. Never I should think has a machine gun done so much damage in the same time as this single gun of the Germans. It was established in a very strong position commanding a wide field of view. A bombing party of ours eventually closed with it and put it out of action. The Huns offered strong resistance only in their third line, the first two lines were taken easily, most of the enemy who were left throwing up their hands. The Berkshires obtained their objective swiftly, in spite of the heavy cost. We hoped to be relieved at once, owing to our heavy losses, when we had obtained our objectives, but the General decided that we must hold the position for one day against counter attacks: so we consolidated and established strong points. The enemy were too demoralised to counter attack, although his artillery made us uncomfortable for some time. But our guns shifted up and soon got to work again, making the enemy withdraw still further. We could see him hurrying back his guns with great speed. We captured many stray Germans hidden away in dug-outs and took many souvenirs - rifles and helmets etc. I will not accuse the Germans of being absolute cowards, but they must have been so completely demoralised by our artillery bombardment that they had no power of resistance. To come down to details of casualties. Of the five officers of my company who went over I am the only one left. Two were killed instantly, one badly wounded and one, our captain wounded in the ankle. Of the officers in the battalion who went over few came through unhurt. It can only be by a miracle that the rest of us got through. However our battalion has done it and done it gloriously. We have received the thanks and congratulations, not only of our Divisional General but of General [Rawlinson] the army commander. The authorship of this account is unknown; but there is a strong possibility that it was another young Newburian officer in the 6th Battalion at the time - Albert Peel. Mrs L Fox, 2, Arthur-road, Newbury, mother of Second-Lieut A J Fox, 6th Royal Berks Regiment, has received a communication that he is in a hospital in France wounded in the recent fighting from machine gun bullets. The wounds are not serious. This short paragraph gives little idea of what lay behind this minor wound. The 6th Royal Berks was part of the 53rd Brigade within the 18th (Eastern) Division, but, in July 1916 the 53rd Brigade was temporarily transferred to the 9th (Scottish) Division to assist in an attempt to capture the village of Longueval and Delville Wood. It was a poorly planned, ill-thought-out plan that resulted in little success and heavy casualties (31 dead, 31 missing and 131 wounded from the already depleted 6th Royal Berks alone). Brigade commander Brig Gen Higginson would later describe Delville Wood as 'the graveyard of my brigade'. Andrew was lucky to escape with a flesh wound. He was treated at No 8 General Hospital, Rouen and rejoined the battalion on 23 November 1916 – the war diary recording him as 2nd/Lt Fox. However, he had actually been promoted to Lieutenant on 4 November. The sad news has been received by Mrs Manley, of Jack-street, that her husband, Pte W H Manley, of the Royal Berks, was killed by a shell on the night of January 27th. Lieut Andrew J Fox, in a letter, says, "It may afford you some consolation to know that your husband did his duty well and faithfully. He proved himself a good soldier, and one we can ill afford to lose. He was a great favourite in the platoon, and well liked throughout the Company; keen, always willing to assist, a soldier in whom his officers placed the greatest confidence." The melancholy news has been received by wire from War Office that 2nd Lieutenant Andrew J Fox is in hospital at Etretat, seriously wounded. It is only recently that we recorded the promotion of this Newbury young man to the position of 2nd-Lieutenant. Temporary Lieutenant A J Fox, Royal Berks, has been promoted Temporary Lieutenant*, as from November 4th, 1916. He is son of Mr J J Fox, of Arthur-road, Newbury, and is now an inmate of Lady Cooper’s hospital at Hursley Park, Winchester, having been wounded a second time. *As with many wartime promotions his commission was ‘temporary’ ie for the duration of the war. This was a far more serious wound, a gunshot wound in his buttock and shrapnel in his right knee. He was admitted into No 1 General Hospital in Etretrat before being sent back to England for convalescence at Hursley Park. Once again the battalion was in the thick of the action, which was known as the Grocery Battle as the objectives were three trenches near Miraumont named Tea, Coffee and Rum Trenches. Andrew, who was with B Company, received his wounds in the fighting in Coffee Trench. All of B Company’s officers were casualties and it was CSM Hine who sent a message back to 18th Division HQ ‘Second objective taken.’ Another Newburian, 2nd Lt Arthur Birch who was with C Company was killed attacking Coffee Trench during this action. Both Newburians are listed in the war diary as having received their wounds at 6.00 am – 15 minutes after the attack commenced. Total casualties in the battalion were 20 dead, 175 wounded and missing. Shortly after he was discharged from Hursley Park Andrew married Lucy Josephine Spencer from Swallowcliffe, Wilts. It seems he was still not fit to return to the Front, so he was posted to Dublin - presumably to the 3rd (Reserve) Battalion, Royal Berkshire Regiment, which was based there at the time. While there he had another operation on an injured limb. In February 1918 there was a major restructuring of the British armies in France and Flanders, which resulted in a number of battalions, including the 6th Royal Berks, being disbanded and their men being transferred to other units. Most of the men of the 6th went to other battalions of the Royal Berks. Andrew is not listed amongst the officers of the battalion at the time of its disbandment; he had not yet fully recovered from his wounds. In August 1918, a year after his marriage, he notified the War Office of this change of his next of kin. This coincided with his return to duty, this time with the 2nd/4th (Territorial) Battalion Royal Berks. By this time the war was finally reaching its end. A series of massive German offensives in the spring that came very close to defeating the British in France and Flanders had been halted by a desperate defence. In July the French and British began a counter-attack, which met with such success that further offensives were mounted. Soon the Germans were being pushed back all along the front, their reserves depleted by their losses in the spring, their morale at an all-time low the German Army could no longer hold back the Allies; but they could still inflict heavy losses on their enemy. A communication has been received by Mrs Fox, Swallowcliffe, near Salisbury, that her husband, Lieutenant Andrew J Fox, Royal Berks Regt, was killed in action on September 1st. The deceased officer, who joined the Army as a private in 1914, was twice severely wounded; first at Delville Wood, and again last February, 1917, near St Quentin. He only returned to the front a month ago. In private life Lieut Fox was a grocer’s assistant, first with Mrs Brice Gould, Bartholomew Street and later at Walker’s Stores. He was a member of the Territorial Force, Newbury Company. Before the war he was working in France, and was in Paris when the war broke out, and was called upon to render military service there. Lieut Fox was the third son of Mr and Mrs J J Fox, Newbury. He was in his 28th year. Born at Ludgershall, Wilts, and in May, 1917, was married to Josephine, daughter of Mr Spencer, Swallowcliffe, Wilts. France, Right Sector Right sector adv Bde front. Moved Bn HQ forward to Chapelle Duvelle. Progress still rather sticky owing to bitter resistance. Shelling on the part of the enemy was very effective on the men in open. Lieut A J FOX killed by shell. The wife of Lieut Andrew John Fox has received a communication from the War Office that her husband was killed in action on Sept 1sr. Lt Fox was in his 29th year and in civil life was a grocer's assistant at one time in the employment of Messrs Walkers Stores Newbury. He afterwards went to France having acquired a knowledge of the French language as English-French speaking assistant and was employed in that capacity at Paris, Nice and Dinant. He was in Paris when war broke out and left there late in September 1914. On arriving home at Newbury he enlisted in the army in October 1914. Having previously been a Territorial he had a good knowledge of the work and very quickly rose step by step to warrant officer in April 1916. At Delville Wood he was severely wounded; on that occasion two fellow officers, Reading men, fell Lieuts Fuller and Collier. After his recovery he was again in France and was wounded at Contalmaison in February 1917, both wounds were the result of machine gun fire. On recovery he was drafted to Dublin where he had an injured limb operated upon. He was promoted Lieutenant November 1917. Lieut Fox had only returned to the front a third time when he was killed. He is the third son of Mr and Mrs J J Fox, Newbury and married Josephine, daughter of Mr Spencer, Swallowfcliffe, Wilts. His eldest brother has been a prisoner of war in Germany since 1914. Two other brothers have served, Charles in the Royal Berks Regiment, lance Corporal 2nd Batt wounded twice and discharged and Alfred 6yj Batt, discharged after service in France. Charles is now serving in France with the British Red Cross. He was buried at a point about one mile North West of Estaires - the map reference 36a.L.22.b.3.7 is given in documentation from the Commonwealth War Graves Commission; this approximates the coordinates 50.655635N, 2.705093W. In 1919 his body was moved to grave 2.E.30 at Merville Communal Extension Cemetery. 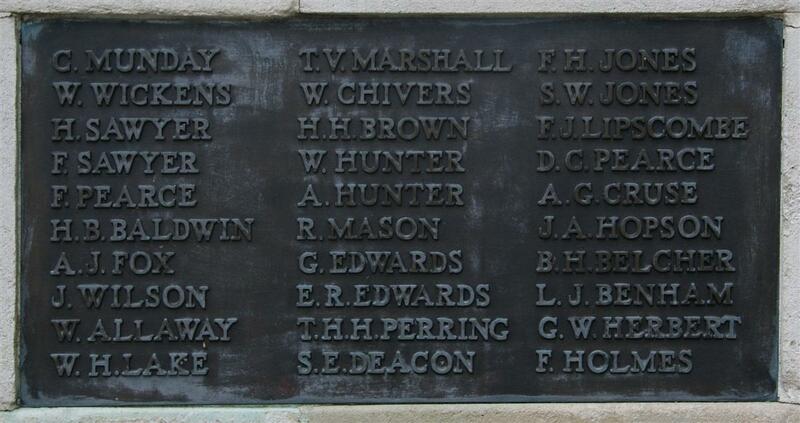 Locally he is remembered on panel 3 of the Newbury Town War Memorial. Following his death there was a dispute over the disposition of his estate. His father, Joseph, produced a will written in 1916 leaving everything to him, in an attempt to claim monies due to Andrew from the War Office. This amounted to £139, a substantial sum in 1919, enough to buy a small house. In his letters Joseph has no time for Andrew’s widow, Lucy – suggesting she had reneged on an agreement to share Andrew’s estate and pension and was little more than a gold-digger. I am over 60 years pf age and have four sons in the Army (not conscripts) one with 17 years service 1st Hants Regt another 15 years 2nd Royal Berks, another 7 years 2/4 Royal Berks, all of them have been very seriously wounded and one killed in action. All belonged to the First Exped Force. I am a poor working tailor. Yet this woman [Lucy] says I am better off than her. On the other hand Lucy’s letters suggest that she is more interested in Andrew’s personal effects, items of sentimental value. I am anxious to know if any of his sentimental belongings has been recovered. The War Office has to follow the law; so they informed Joseph that Andrew’s marriage rendered his will void and that Lucy would be the recipient of any outstanding monies owed and a widow’s pension. Andrew’s brothers mentioned by Joseph were: Edward who went to France with the 1st Hants in August 1914, was captured and spent most of the war as a prisoner of war; Charles who arrived in France with the 2nd Royal Berks in November 1914, was wounded twice and invalided out - he returned to France with the Red Cross; and Alfred who also served with the 6th Royal Berks and was also invalided out. Mr J J Fox, of Arthur-road, who has a soldier son a prisoner in Germany, has received a communication as to the new arrangements made by the Hampshire Regiment Prisoners of War Fund. This organisation has taken over the entire charge of all men belonging to the regiment, and good parcels are being sent three times a fortnight. In the past the men were adopted by ladies, who sent regular parcels. Relatives are no longer able to send their own food, which at first sight seems hard, as no doubt special value was attached to the one “sent from home.” But 3s or 5s are made up, consisting of suitable and varied articles and the packing and despatching is in expert hands. The system is really an admirable one, and ensures for the prisoners a regular supply of the things most needed by them. Life as a prisoner of war was tough, sometimes very hard indeed; parcels from home were often what stood between prisoners and starvation. Towards the end of the war, when food was scarce throughout Germany, there were times when they enabled prisoners to eat better than their guards. The miracle is that they got through to the POWs as often as they did. Of men who have shone in retreats and attacks. When we held fifty thousand Germans at bay. Teaching each on the use of rifle and spade. Some won great honour – alas! others died. But alas! this Brigade was forgotten at Wareham. Some are still training and some in graves laid. Of the 50th Brigade, how and when they had fought. They must still be there if my order’s obeyed! The ghosts of the “Dorsets” of the 50th you’ll see. For the order ‘Advance’, which shall never sound.